The chili peppers design is part of our fruits and vegetable collection. 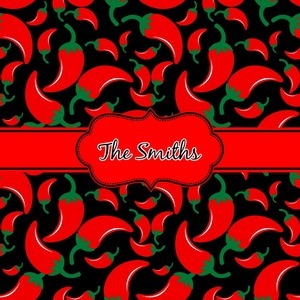 This design features red chili peppers in various sizes on a black background. The background can be changed to any color. I would recommend trying our white, gray, gold, teal or purple color as background choices. We have chosen the classic ribbon with the Decorative Rectangle Label in red with black accents. The personalization is the name/text. You have a choice of ribbons, labels and personalizations styles to choose from.